It's funny how even if you follow a genre closely you can still miss some pretty successful authors, I guess that there are just so many novels published nowadays that this will become increasingly common. I haven't read anything by Holly Black before but I have been aware of her work without realising it. She is the imagination behind the Spiderwick Chronicles - a young adult series that became a hollywood film back in 2008. Having a young niece and nephew I saw the film the same year it came out, I wasn't actually that impressed and it felt like the director hadn't understood the story and just joined together a few events from the book that translated best to the screen without concentrating on the actual plot (something that happens all too often). The idea was good though and it seemed see that the originating story was a rich one with some interesting ideas. 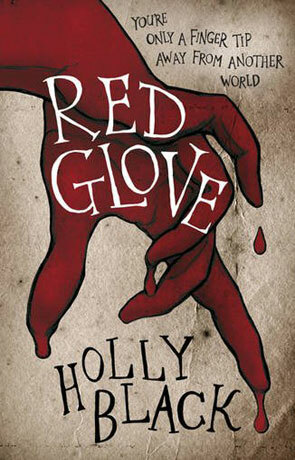 Red Glove is a more adult novel than Spiderwick and describes a contemporary world subtly different to our own where magic is very much real and those who have such talents are known as "workers". The principal protagonist is Cassel who after discovering his hidden powers must now use them in the wider world while also learning to avoid his previous mistakes. The book follows on directly from the events of "White Cat", which I haven't read and the story can be quite easily enjoyed if you too haven't read the previous novel. While this is clearly a more "grown up" book than the authors previous series, the narrative style is still firmly placed within the young adult market and I'm not convinced that it works as well as it could, especially set against the admittedly effective dark ambience that permeates the story. It's almost like the author couldn't decide if it was going to be a book for adults or not. There is however no doubt as to the authors talents and the best part of the novel is the beautifully written characters which are brought to life in front of your eyes with rich and dynamic prose and a pace that is almost breathless. I loved how the protagonists aren't really good guys, the whole of Cassel's family are essentially con-artists and this makes a great change from all the whiter-than-white people often represented in young adult / contemporary fiction. It's even rarer to see a family of criminals used as central characters and it really does make a refreshing change. Cassel himself seems to constantly walk the wrong side of the a fine line between good and bad. You can however see that he is doing his best to not be like his family and when he does something illegal it's often an attempt to do well and due to circumstance. The world building is both effectively managed through the use of exposition and very rich, the idea of many magic wielders being part of an organised crime network is pure genius and quite original. The actual magic system is also well developed, "working" magic on someone - each has their own particular gift in this regard from emotions to luck, transformation and even death - provides a "blowback" to the wielder; a little taste of that dished out and the more power used the greater the potential blowback will be. The story takes a little while to really get going, the first part of the novel largely taken up with Cassel's return to school and it's only after a death of someone very close that the plot moves forward. Once it does however it doesn't stop and there is enough intrigue, twists, turns and colourful characters to really keep you hooked. I must admit that aside from the slight young adult flavour I really did enjoy this novel, the authors voice is both strong and rich and the novel has a nice feeling about it. When combined with a great story and brilliantly written characters depicted in various shades of grey Red Glove emerges as a worthy read indeed. Written on 28th May 2012 by Ant.